You may recognize the anglerfish from its dramatic appearance in the hit animated film Finding Nemo, as it was very nearly the demise of clownfish Marlin and blue-tang fish Dory. It lives most of its life in total darkness more than 1,000 meters below the ocean surface. 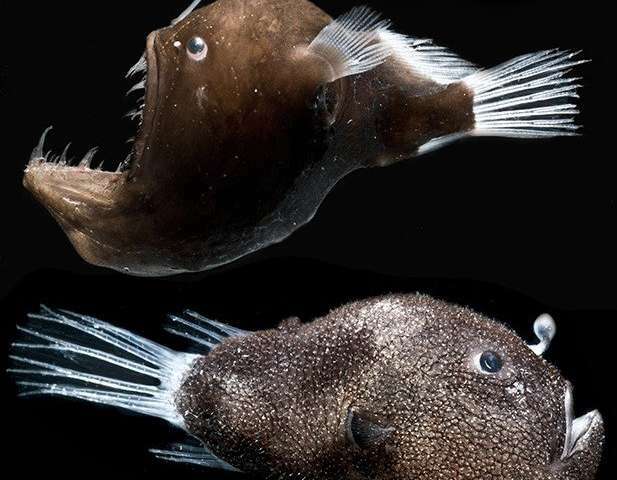 Female anglerfish sport a glowing lure on top of their foreheads, basically a pole with a light bulb on its end, where bioluminescent bacteria live. The light-emitting lure attracts both prey and potential mates to the fish. Despite its recent fame, little is known about anglerfish and their symbiotic relationship with these brilliant bacteria, because the fish are difficult to acquire and study. The researchers report their findings in a new study, published in the journal mBio. The analysis revealed that the bacteria have lost some of the genes that are needed to live freely in the water. That's because the fish and bacteria developed a tight, mutually beneficial relationship, where the bacteria generate light while the fish supplies nutrients to the microbe. "What's particularly interesting about this specific example is that we see evidence that this evolution is still underway, even though the fish themselves evolved about 100 million years ago," said Tory Hendry, assistant professor of microbiology at Cornell University and the paper's lead author. "The bacteria are still losing genes, and it's unclear why." Most of the known symbiotic relationships between organisms and bacteria are between either a host and free-living bacteria that don't evolve to maintain a symbiosis, or a host and intracellular bacteria that live inside the host's cells and undergo huge reductions in their genomes through evolution. The bacteria inside the bulb in anglerfish represents a third type of symbiosis, where preliminary data suggest these bacteria may move from the anglerfish bulb to the water. "It's a new paradigm in our understanding of symbiosis in general; this is a third type of situation where the bacteria are not actually stuck with their host but they are undergoing evolution," Hendry said. At the same time, the bacteria have retained some genes that are useful in water outside the host. They have full pathways to make a flagellum, a corkscrew tail for moving in water. The bacteria had lost most of the genes involved in sensing chemical cues in the environment that may lead to food or other useful compounds, though a few remained, leaving a subset of chemicals they still respond to. "They were pared down to something they cared about," Hendry said.